On January 10, 1956, two days after his 21st birthday, Elvis Presley had his first recording session for RCA, held at their studio in Nashville. On January 27, "Heartbreak Hotel," with "I Was the One" on the flipside, was released and hit Number 1 on the charts, as did "I Want You, I Need You, I Love You," "Hound Dog"/"Don't Be Cruel," and "Love Me Tender," all released in 1956. Capped by the November release of his first Hollywood movie, Love Me Tender, Elvis Presley had become a superstar by the end of 1956. Also produced in 1956 was an Elvis hat manufactured by the Magnet Hat and Cap Corp. in New York City. This hat was owned and worn by the King and comes directly from the Elvis Presley Museum. 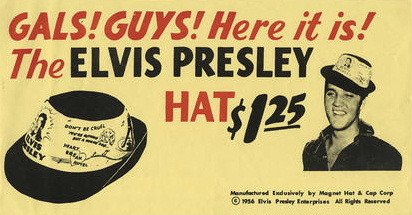 Here is a vintage advertisement showing Elvis wearing the hat described above.